Come & meet our miller! 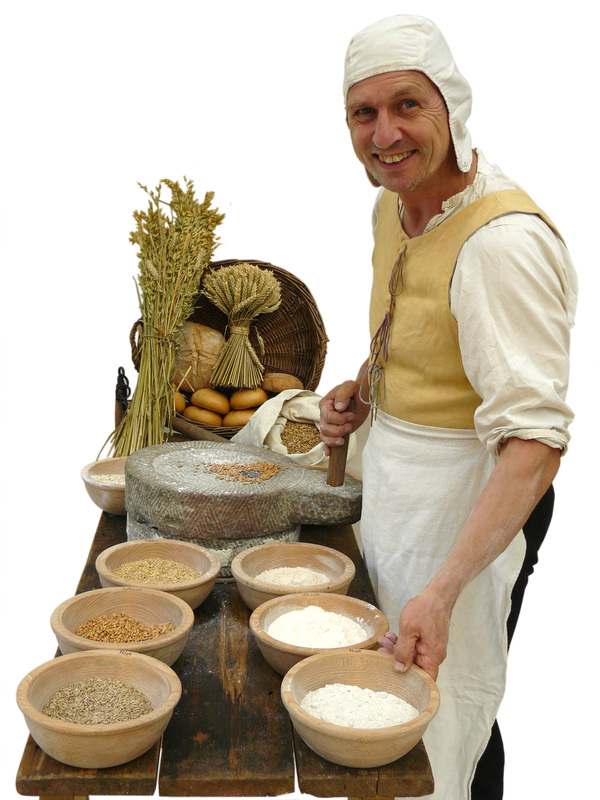 A fun & informative display where your visitors can touch & see the different grains, flours and breads used by medieval people. 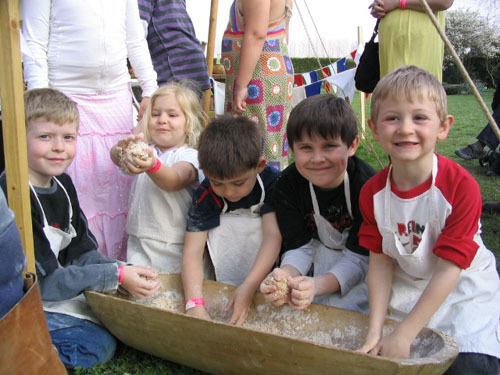 They can even make flour on the quern or have a go at winnowing. This display is run for passing trade throughout the day. Displayed on the table will be various grains and the flours made from them such as pea, barley, rye and wheat. Visitors will be able to touch, see and learn about them. They will also be able to see the various types of bread made from the flours such as maslin (a mixture of Rye & Wheat) or horse bread (A poor bread made from a mixture of grains). They will be able to learn how bread was an important status symbol in medieval times, white wheat bread for the rich and brown rye bread for the poor and many varieties in between, depending on your pocket. We have a stone hand quern which were still being used right up till late medieval times and beyond. A medieval person could take their grain to a miller but it was much cheaper to make your own. 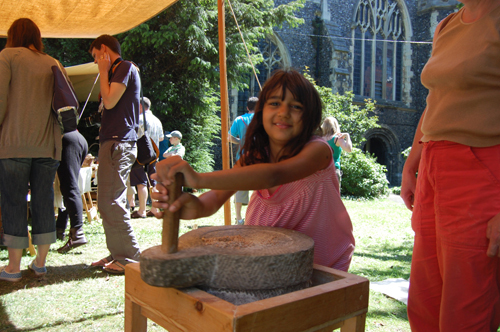 Young and old can have a go at turning the quern to produce flour themselves. They can also try their hand at winnowing the grain (removing the chaff) with our winnowing basket. What yucky things could you find in your bread & flour?A new section of this display which shows some of the horrible things that you might find in your medieval bread or flour. Whether it’s cobwebs, ash or the horrible grain weevil! Unscrupulous bakers would eke out the flour in their loaves with make-weight items such as chalk or ash or cobwebs. 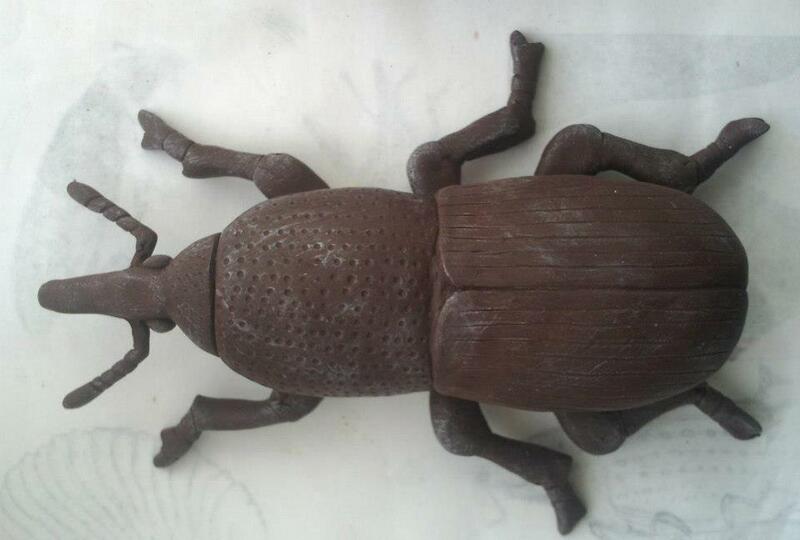 One of the biggest enemies for the miller or the baker was the grain weevil. The weevil lays its grub in the grain which then eats the grain from the inside and emerges as an adult. Bread made with weevils in tastes appalling! Run for passing trade, and often with the cooking display (Where visitors can make butter), this has proved a popular and illuminating display for visitors young and old. Particularly in this current climate where people are keen to learn more about the simpler things in life. This display takes a little preparation as the breads are baked in the days before an event.